If you do not believe that Nairobians pay more than is sanely allowed for stuff, you are welcome to visit the Wakulima Market. Here, you will be shocked by the price of items like potatoes. You may find a 2 KG of bucket of potatoes costing between Ksh 80 to Ksh 100. Just across the wall fence, a potato throw away at Muthurwa market, the same 2 KG bucket goes for between Ksh 120 to even Ksh 160. Meanwhile, 5 potatoes may cost ksh 20 in the nearest vegetable vendor back in the estate. The situation isn't that bad , until you discover that a 20 Kg bucket of potatoes costs Ksh 550. 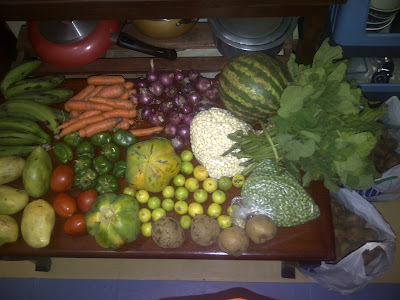 It is for this reason that I have taken to shopping at the Wakulima market. Another reason to visit the market, other than the friendly prices, is the bigger variety of produce available, such as "green" maize in the low season, and produce freshness. 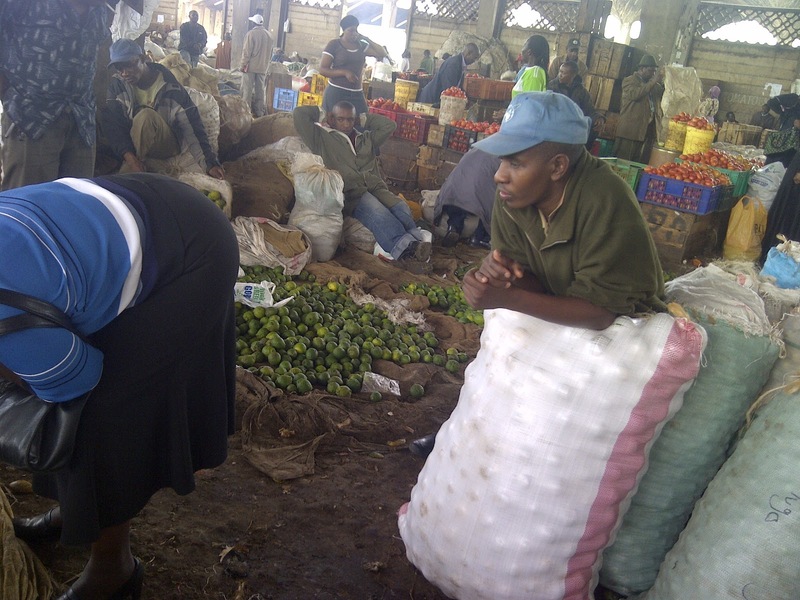 Shopping at Wakulima market, however, is not for the faint hearted. The market is located along Haile Selassie Avenue, just before the Landhies Road / Ring Road round about. If you drive, you may find parking along the streets around Wakulima House , though this may not be the safest street to park a Toyota, due to car part thefts. The area is also a preferred parking for suppliers to the market. Another challenge to those brave enough to venture into the market is the number of people. There are many traders and a number of trucks doing supplies. This means that you end up with narrow walking passages in between the piles of produce, you may even be required to walk sideways just to fit into them. Along the narrow paths, you will soon discover that you are probably in the wrong place - other shoppers do it in huge 90 kg sacks, which are carried by porters on their shoulders, at a fast pace. The porters will at times hiss for you to jump out of their paths, but often you only notice them when your shoulders collide, quite a painful ordeal. If you are not careful, you may even lose your balance. For the above reason, it is advisable to come into the market around 12 noon on Monday's to Saturdays, or between 11 am and 12 noon on Sunday. The market is closed for cleaning at 1 pm Monday to Saturdays and 12 noon on Sunday. It would be good if the market was closed at night, allowing for a longer shopping period. Coming into the market in the last opening hour also means that you can get discounts when not buying in bulk, as traders look to make closing sales. The market still operates for a couple of hours after the gates are closed. It is also advisable to carry used polythene "paper" bags, especially from supermarkets, as this can be re-used to carry vegetables. Also remember to dress appropriately, and not conspicuously, as you may become a target for exploitation from the sellers through higher prices and the huge number of porters, who even offer to carry empty bags for you, at a fee. Another reason you should dress appropriately is because the market can be quite muddy, despite the cleaning , especially when it rains. You will also find that a great number of the produce at the market comes from Uganda, such as water melons and mostly Tanzania. Around the market, you will find trailers which mostly ferry potatoes from Tanzania to satisfy Nairobi's insatiable appetite for potato chips. Tanzania also does most of other supplies during the dry season when produce from Kenya is low. For young men, you may find a number of the ladies offering you advice on where to purchase stuff, especially when they note you are a newbie. The porters can ferry produce from the market to a destination around the city, at an agreed fee. The market has two gates, though past opening hours, exit is only though one gate. Some of the fresh produce bought at the market, including maize, peas, pumpkin leaves can be boiled and frozen for use over a couple of weeks. Do you feel that Wakulima market offers better value than your mama mboga?